I’ve been meaning to post these photos from our sew-in for the last week, but life is just flying by this summer! It was a hot and sunny day on the common, and we we so lucky to have Taz come to take some photos for us! 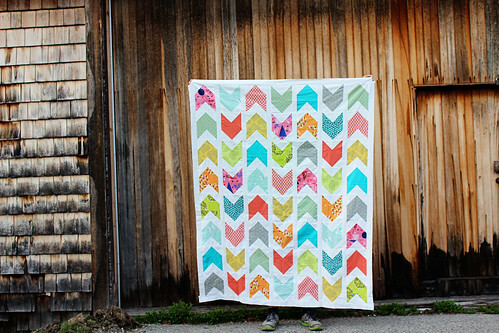 She does such lovely work, and you can check out more of here photos here. 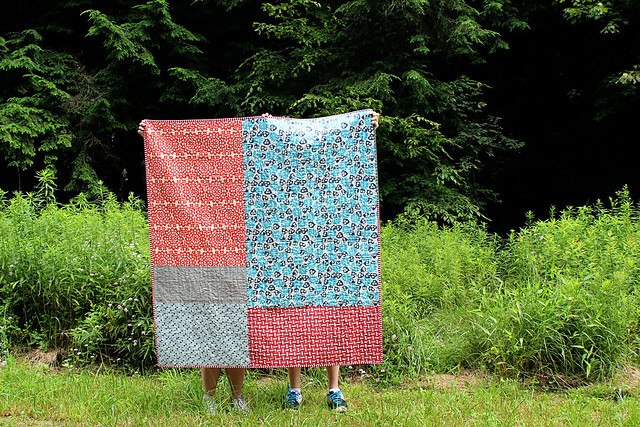 Our pile of finished quilts is growing, and we’re gearing up to make a few big deliveries soon. 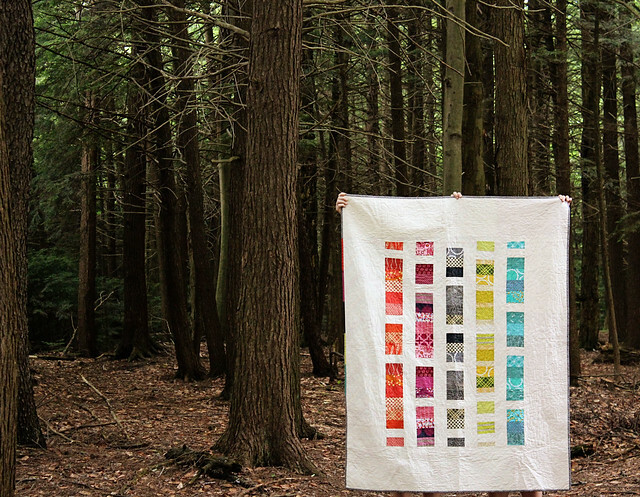 We still have many quilts in progress, too. This has become such a larger project than I could have imagined, and I’m so grateful for all of the help and support that our guild has received! 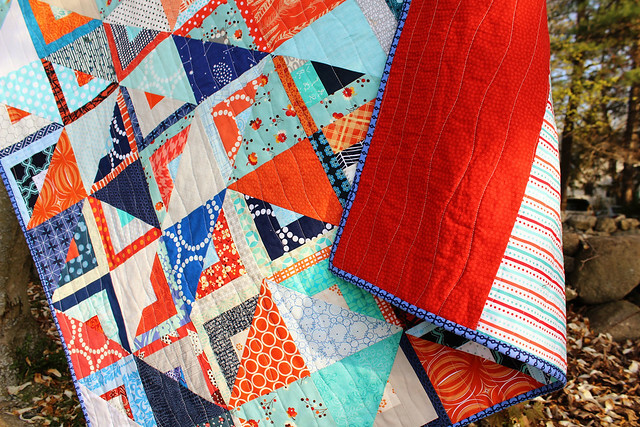 There are more quilt photos being added to our flickr group all the time, so keep checking back to see the finished quilts! 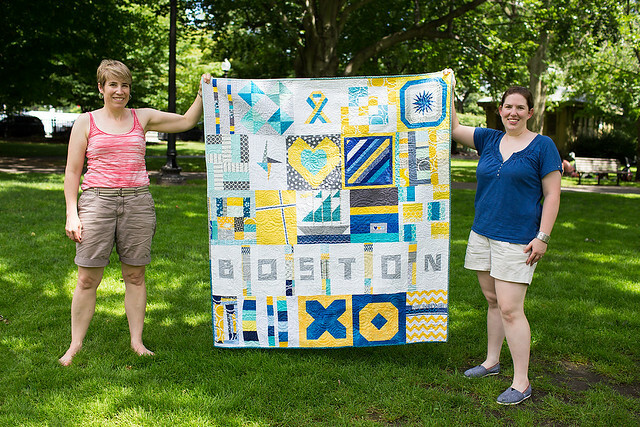 A Quilts for Boston Update! Well, it only feels like about a million years since my last post! Things around here have been busy, but so good too! I know it sounds super nerdy, but I’ve been really energized about the research I’ve been working on lately, and it makes me want to work more more more! (an aside– I keep quoting this commercial. “We want more! we want more!). 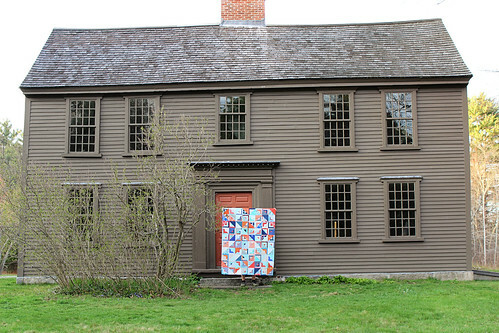 And of course, Quilts for Boston has been full steam ahead! 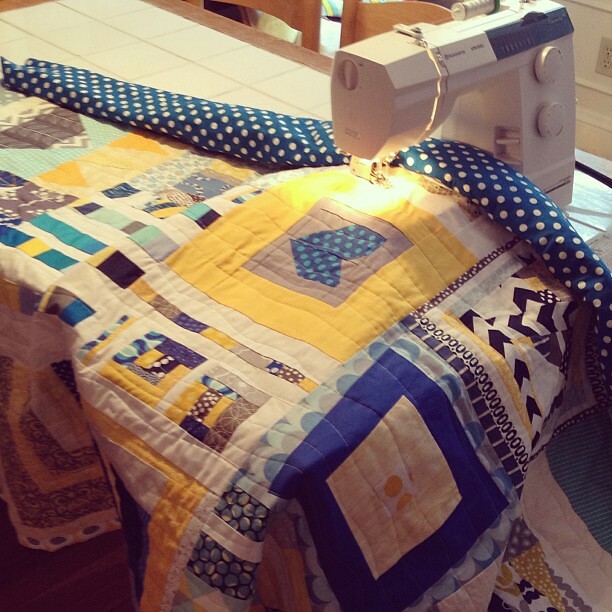 We have had many meetings and sew-ins and these quilts are really coming together! 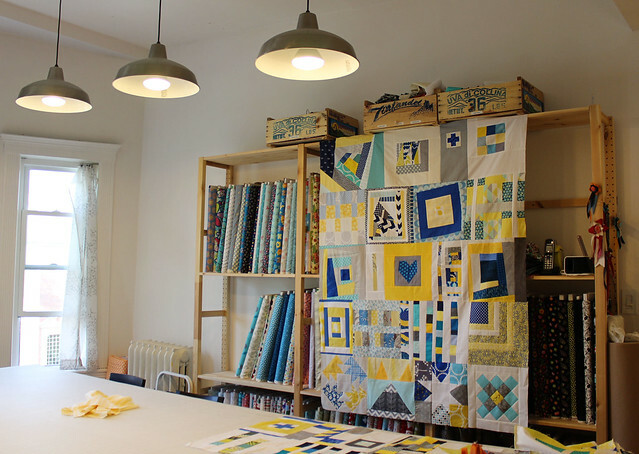 Eventually we’ll have photos of all of the finished quilts added to our flickr group, but so many are in various stages of progress at the moment that we’re just snapping photos when we can. 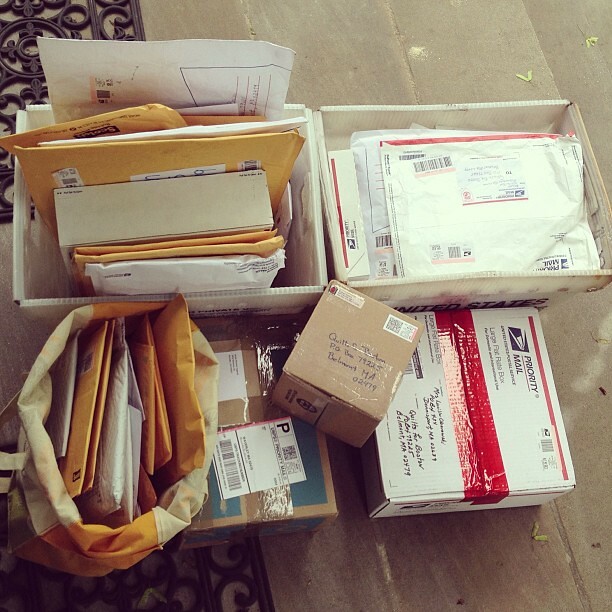 Leading up to our deadline for mailing blocks in, I was at the post office every single day, with a bin (or two!) of mail waiting for me! 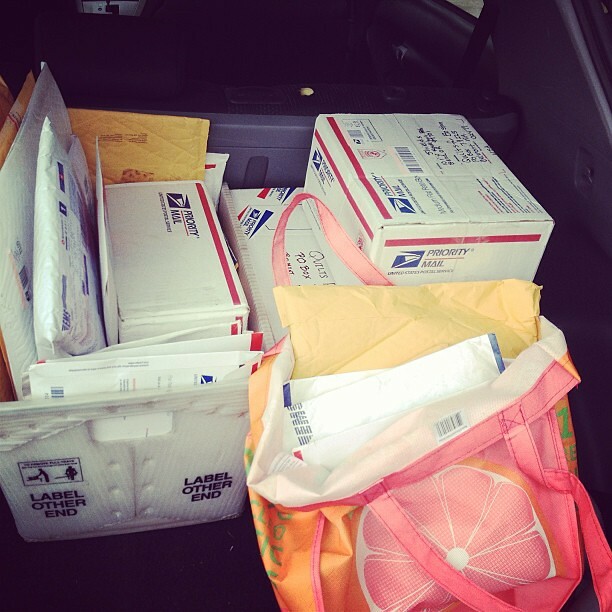 I really love the women working at the post office, who continually got excited about our mail (“Today you have packages from Australia!” I’d hear when I walked into the post office) and helped me haul it all to my car– definitely above and beyond the call of duty. As I opened each envelope or package, I’d keep track of where it was sent from, how many blocks were included, and if a note or letter was in the package. We have quite a file of letters, and we plan to archive these when we’re done with the project. Opening the mail and tracking the blocks took the majority of my free time for a few weeks. 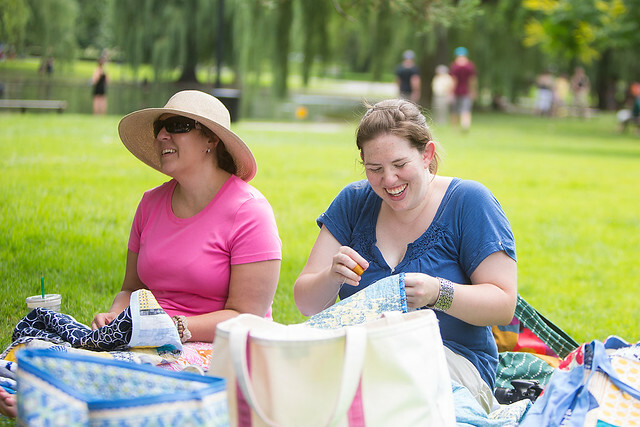 I then took my box full of blocks and sorted them into bundles to give to members of the Boston Modern Quilt Guild and volunteers who were willing to assemble them into quilt tops. 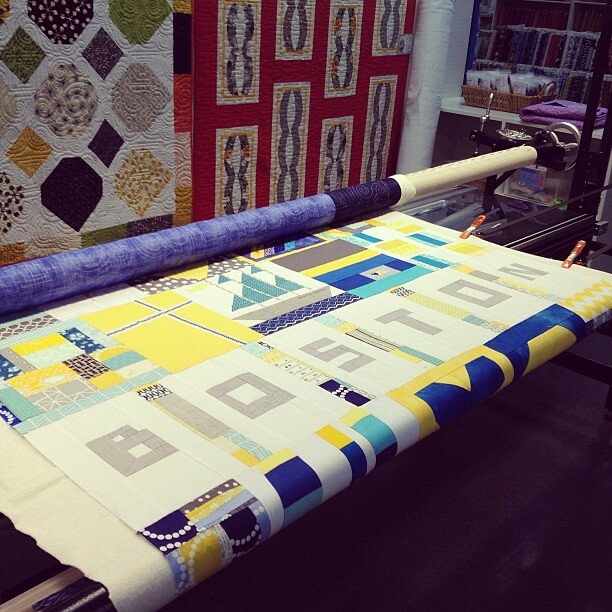 We have SO many quilts in progress at the moment that it’s staggering! 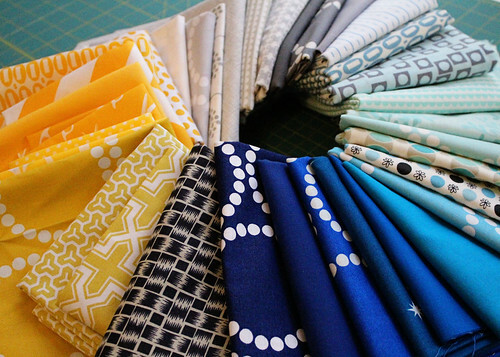 Initially we were hoping to maybe make 20 or 30 quilts… and then we raised that estimate to 50, for which I figured we’d need about 1000 blocks. 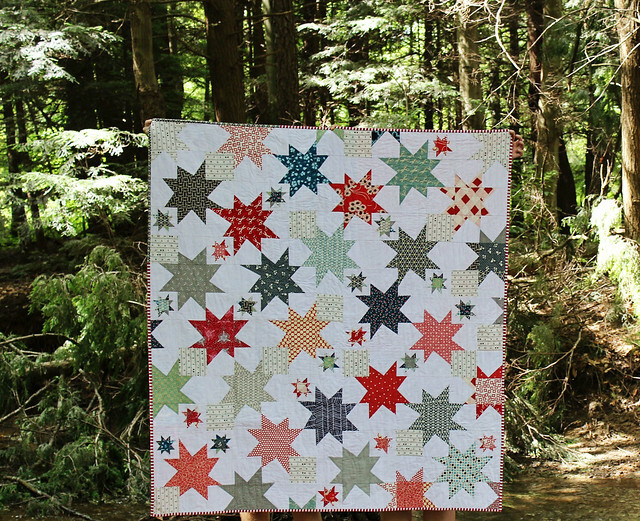 At last count we’ve surpassed 2000 blocks, so we’re on track to make closer to 100 quilts! 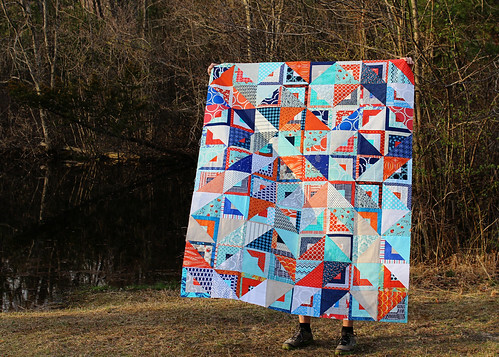 Although this project has taken over my free time (and most of my sewing space) for the last couple of months, I have managed to get some personal sewing in– I’ve finished a few quilts I’m planning to share here soon! 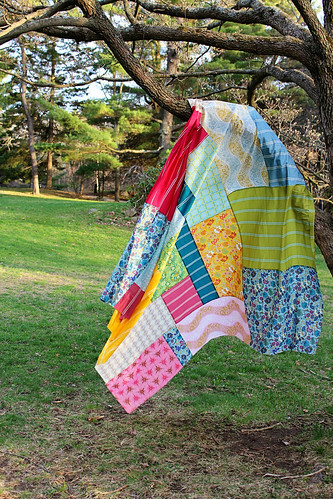 Quilts for Boston: Help Spread the Word! Hi Friends! 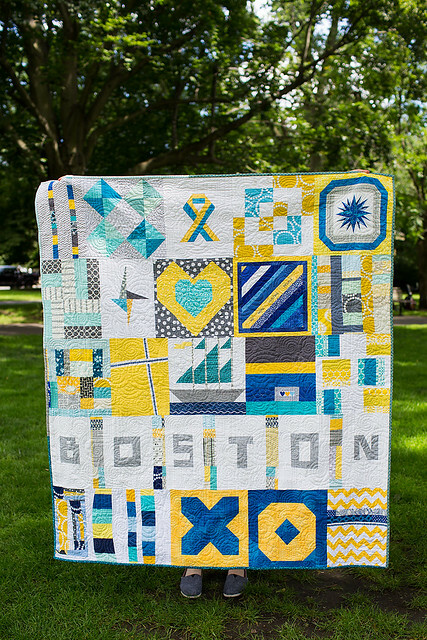 I’ve been working with my fellow Boston Modern Quilt Guild members to pull together a plan to make quilts for those affected by the bombing in Boston this past week. We’ve published our plan on the BMQG blog, and have a tab there where we will keep all info up to date! 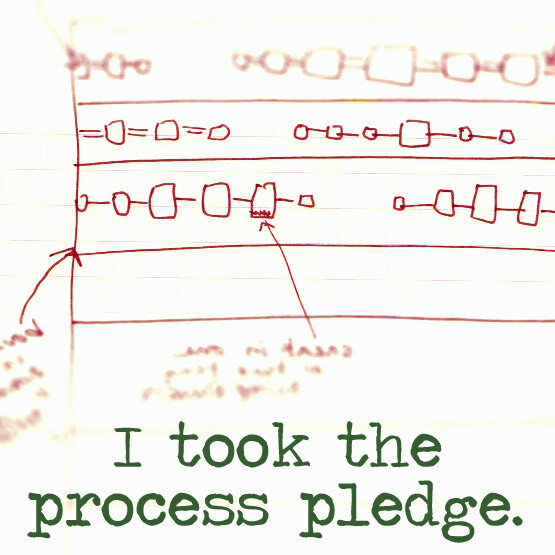 I also thought I’d share the details here– this is cross posted over on the BMQG blog. 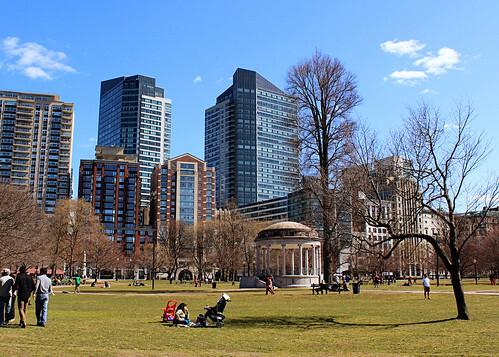 One week ago today, the usual flurry of activity in our city came to a halt and we watched with sadness and disbelief as people who came to celebrate the 117th running of the Boston marathon were injured and killed by bombs set off near the race finish line. 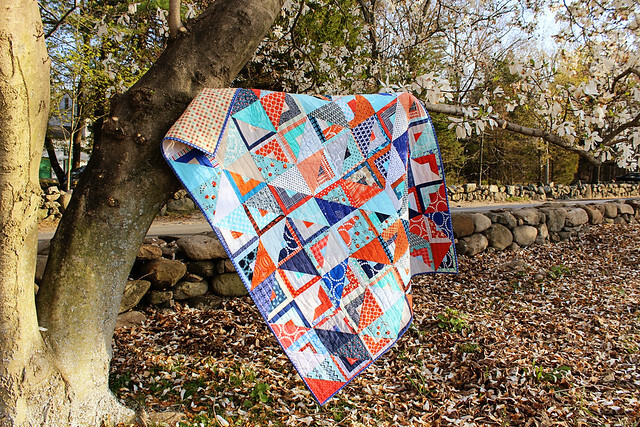 In response to the events of the past week, the Boston Modern Quilt Guild wants to find a way to help those in our community that have been directly affected by the bombing and subsequent events. 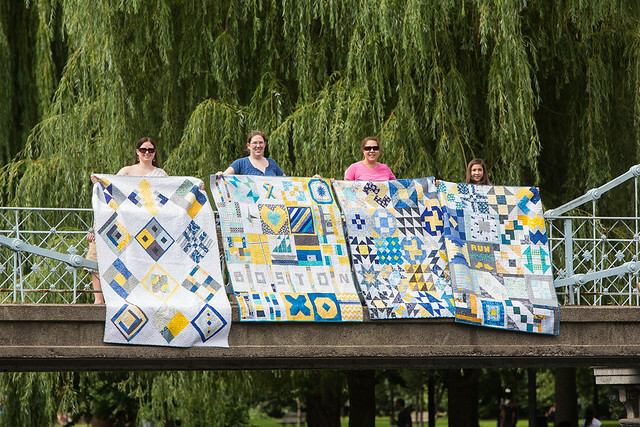 As a guild we plan to make and distribute quilts to those who would benefit from a show of support, and we need your help. 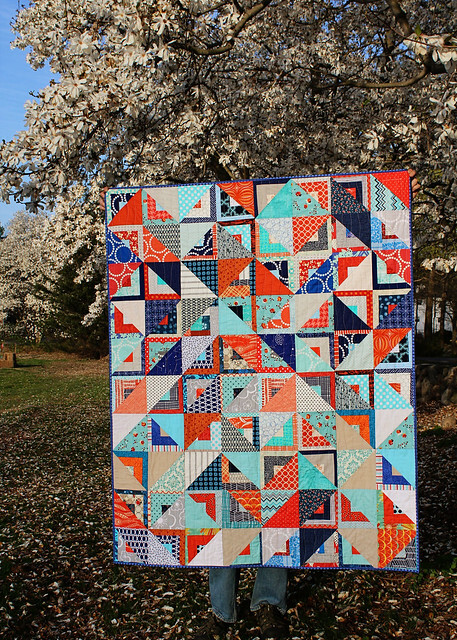 We are asking the modern quilt community to support our efforts by sending us blocks for these quilts. 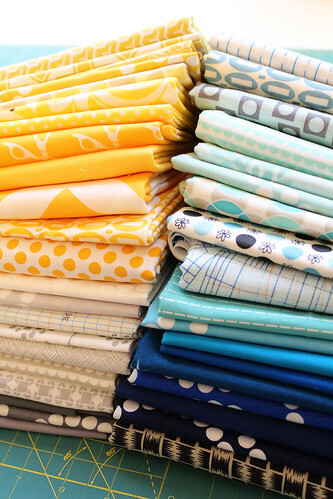 Additionally, we will accept donations of fabric to be used for binding, sashing, and quilt backs. 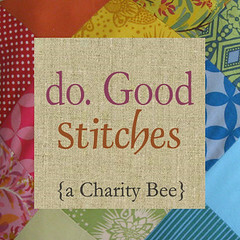 We would like to have the quilts ready to deliver to those in need as soon as possible, so we ask that you send your blocks to us within a month, by May 24th, 2013. 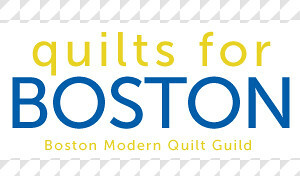 Blocks sent to the Boston Modern Quilt Guild should be blue, yellow, gray, and white. 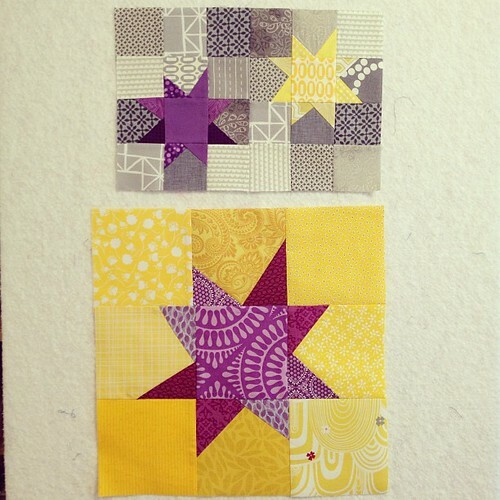 All blocks should be 12½” tall x the width of your choice. That could mean 12½” x 7”, 12½” x 12½”, or anything wider, more narrow, or in between. Please machine piece your blocks in any style you would like. 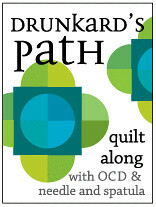 Please use only “quilt shop quality” 100% cotton or cotton/linen fabrics. Both print and solid fabrics are welcome. 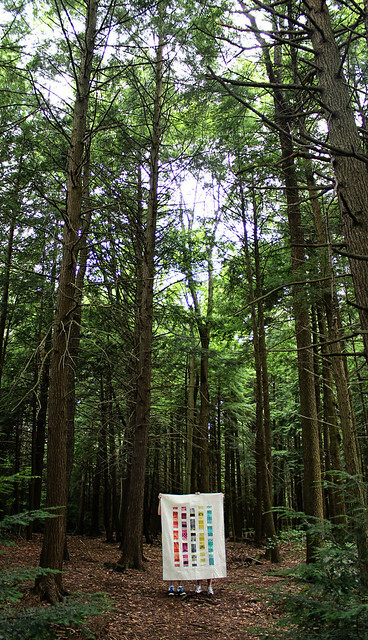 Our preference is white or light gray 100% cotton thread, but any coordinating thread of good quality will do. Please consider adding photos of the blocks to our flickr group. This is not required, but it will be wonderful to share the blocks as we are making them and to see what people are working on. 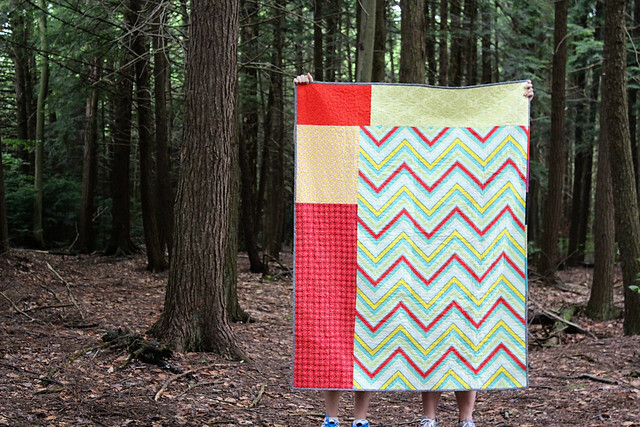 Our goal is to make bright and modern quilts that will bring cheer to those who need it most! 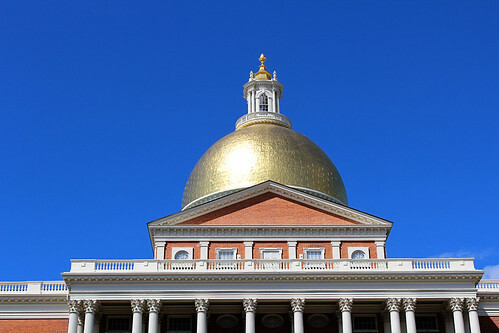 We chose this color scheme as these are the colors of the Boston Marathon, and have become the colors representing the One Fund, an organization formed to accept monetary donations for the victims, as well as the tribute tees sold to benefit the One Fund. 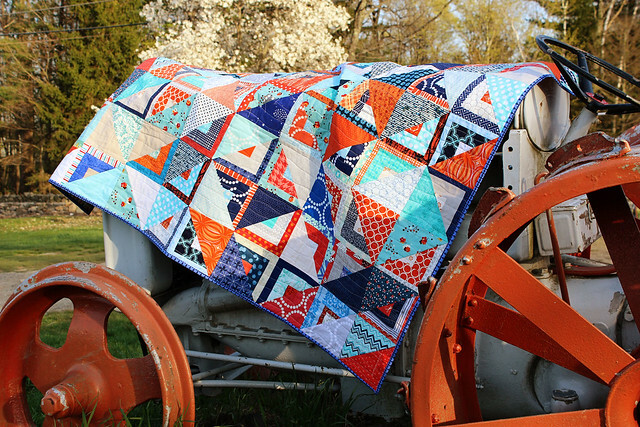 Be creative with your blocks, and make any pattern or design that inspires you! If you have any questions, please contact: bostonmqg@gmail.com or leave me a comment here on Greenleaf Goods! 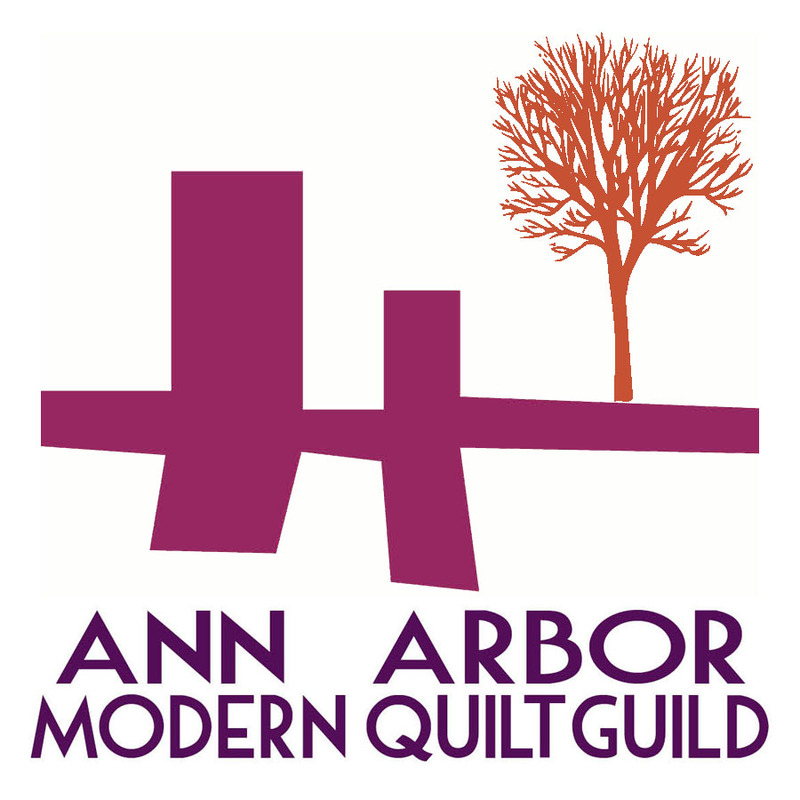 A big thanks to the very talented Dorie, who created our logo and button! You can grab the button for your own blog or website over on the BMQG website. This past Friday was one of the craziest I’ve ever experienced. Friday morning we woke up to the news that the suspects in the bombing had engaged in a shoot out with the police about a mile away from our house, and one suspect was on the loose in our neighborhood. Our town was in lockdown, and we were instructed to stay indoors and not to open the door except for a uniformed officer. So–if you’re trapped indoors all day with a bunch of nervous energy, what can you do? I decided that THIS was why I buy so much fabric! I had plenty to work on, and managed to finish 3 quilt tops in one day. 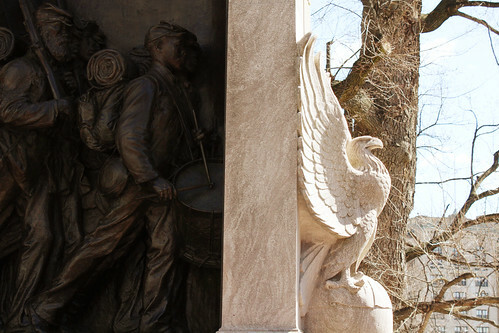 When we were finally allowed outdoors, we took Simon to the park to stretch our legs, and while we were there we heard a round of gunfire and rushed home. We learned that the suspect had been cornered and was quickly captured. What relief! People lined the streets of Watertown and cheered for the police as they slowly filed out of town. We are all so happy to have a bit of normalcy restored. 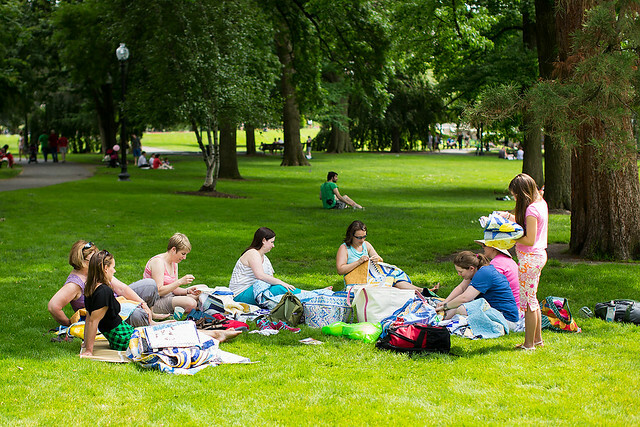 The next day I attended the Boston Modern Quilt Guild meeting. I was so happy to be amongst friends, and we needed to brainstorm about what we can do as a guild to respond to the crazy events of the past week. 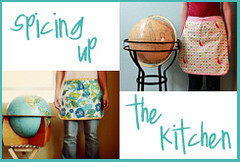 We’re cooking up an idea and will reveal the details soon, so stay tuned! 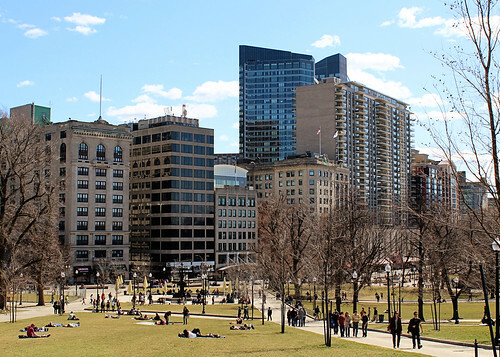 A few weeks ago, Justin and I had a free Saturday afternoon, and the weather was just perfect. 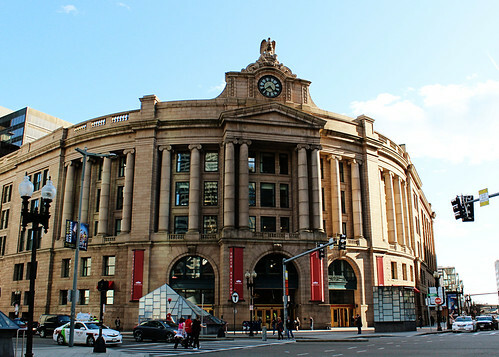 We decided to hop on the T and head down into the city to soak up some of the sights and to play “tourist” for a day. 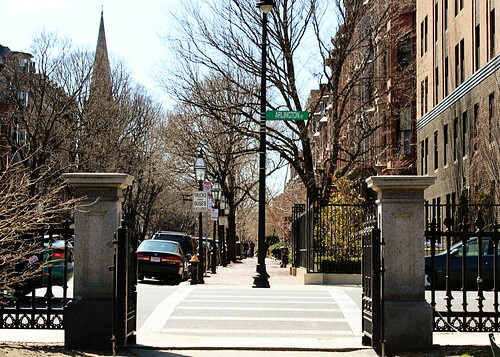 Justin has developed an incredible mental map of the Back Bay since he began working there this fall, and he loves hanging out on Newbury Street or at Boston Common. 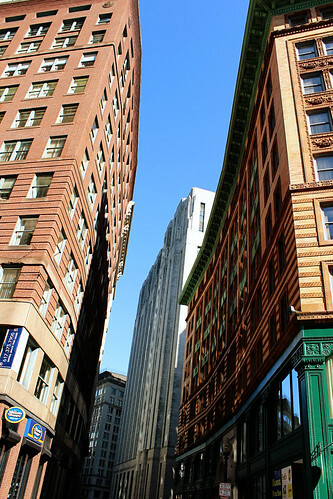 On his lunch breaks, he heads down Boylston Street and I can often tell where he’s been based on his instagram photos. It took me a little while longer to warm up to the city. As many of you know, we moved here from Michigan in late summer, and like many others, I tend to be wary of new things. 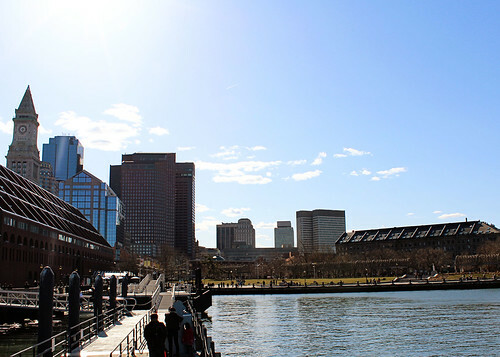 Last month I was on a work trip and I found myself looking forward to going home to Boston, and I remember being a little surprised by the thought. 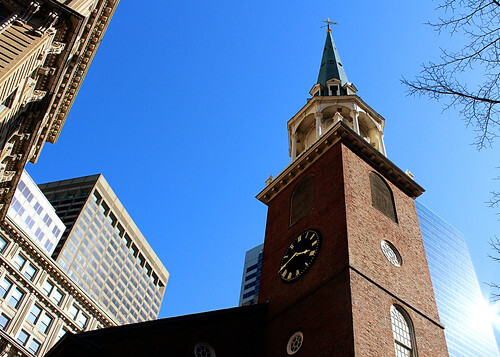 Boston? Home? I really hadn’t thought of it that way until recently. We had a lovely time this past weekend with family in town to visit, and on Monday morning I know that Justin wanted to head down to watch the marathon finishers. He’s run his fair share of marathons, and there’s something about all of that excitement and positive energy around a race that we both love. 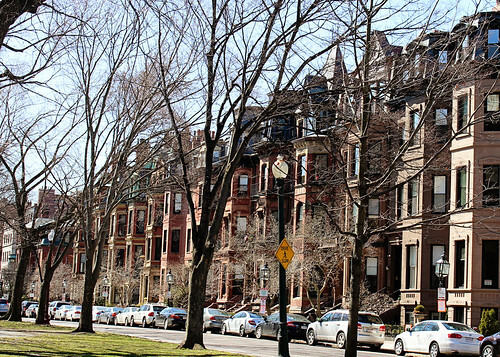 And anyone who has run a marathon knows that Boston is iconic—it is THE race. The marathon finishes right down the street from Justin’s office, and he’d been tracking the progress as the crew set up for the race the previous week. 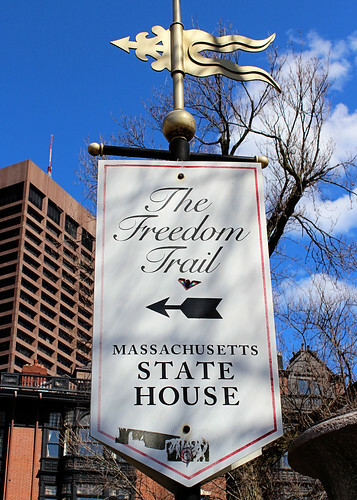 It was easy for him to do, as he usually takes the T to Copley Square, right where the finish line is set, and then walks down the block to work. We were a bit tired on Monday morning, and I have been nursing a knee injury. I mentioned to J that standing around for hours on concrete might not be the best, and although I bet he was disappointed, he didn’t let it show. 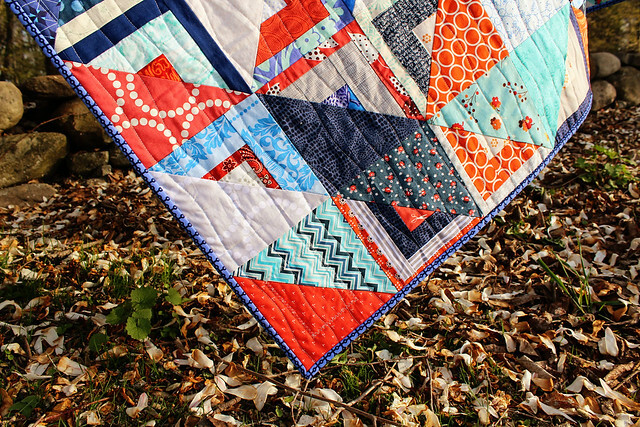 We had a lazy morning on the couch instead, watching the marathon coverage while I worked on hand stitching my single girl quilt. Having lived with Justin and his Runner’s World subscription for a number of years, I actually had a few favorites in the race, and we cheered on the elite US runners as they finished. And then, for a little while, we went about our day as usual, until we heard the news. 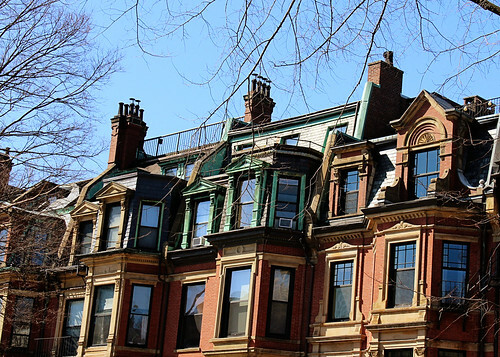 Like many, many others, we are just stunned and devastated by the bombing. Honestly, I think we’re having a little trouble processing it. The photos and footage of the bomb and aftermath are right there—right there in the spot Justin walks every day. Right there where we walked around the city, making plans to come back to shop and to eat at every restaurant that looked good. Right there in the city we just recently learned to call home. I appreciated and responded to every message and text that we got from family and friends checking to see if we were ok. Our lives are still a little out of whack, and I think they will be for a bit longer. Justin can’t return to work yet, because his office building is in the official crime scene area and is inaccessible until the FBI wraps up their investigation. I never thought I’d write a sentence like that. 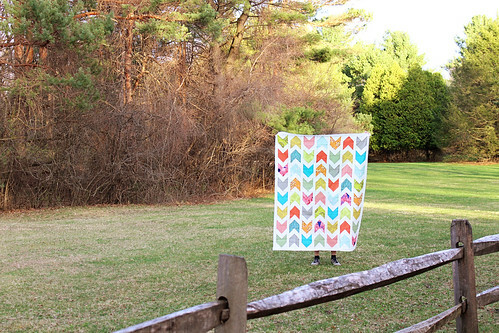 I’m thinking about what I might do to help, and of course my thoughts turn to quilts, as that is one thing I can offer. 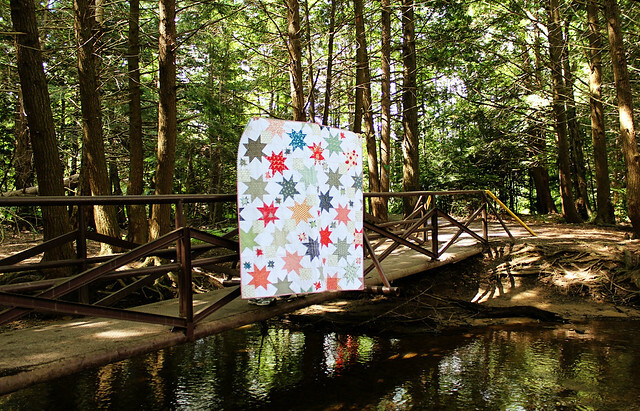 I have it on good authority that we will be brainstorming about this at the Boston Modern Quilt Guild meeting this coming weekend, and I’m glad to know I’m not the only one thinking about what good quilts (and quilters) can do at this time. Mostly I just feel heartbroken for this city I have been learning to love.